Simply put we will all find out soon what gains are to be had. I'll video everything and be as open and transparent as possible. More even air flow to the rear cylinders which the stock lid restricts airflow. Intercooler brick is not covered in Silastic to seal up against the provided spacer plate, that the competitor kits require you to do. During install we noted an oil trail going to the rear cylinders indicating lack of air flow as the others were cleaner, looking at the lid itself you can see it is restricting air flow to the rear cylinders, not only will this give colder intake temps but also more air flow into ALL cylinders. Last edited by GenF-GTS; 31-01-2017 at 12:12 AM. Increased plenum volume is always a good thing. Does it affect bonnet clearance? Not at all, you will be able to run both our 10mm blower spacer plates and our 10mm lid spacers and then you will still have about 5-10mm of clearance left over. LSA Lid Spacers 1 off Special!!! Hi Guy's as you know we have invested a huge amount of time and money into the LSA lid spacer so we are going to run a 1 off special on them to try and get some money back, they will be $600 AUD for all of February, as soon as the month is over they will be $650 AUD, no mates rates or combined discounts will ever be applied there after. Trade prices for shops will also be the same pricing. At the end of the day this was built for our race car, and you guys are just basically benefiting from what were doing for our own needs. We are waiting on our custom made o-rings which will be here in about a week then we can start shipping them out. If you'd like to order please email or message us. stating what you would like to order your name address and phone number we will then invoice you. It is clearly obvious that the stock lid design inhibits air flow to the rear cylinders in both banks indicated by the red arrow. 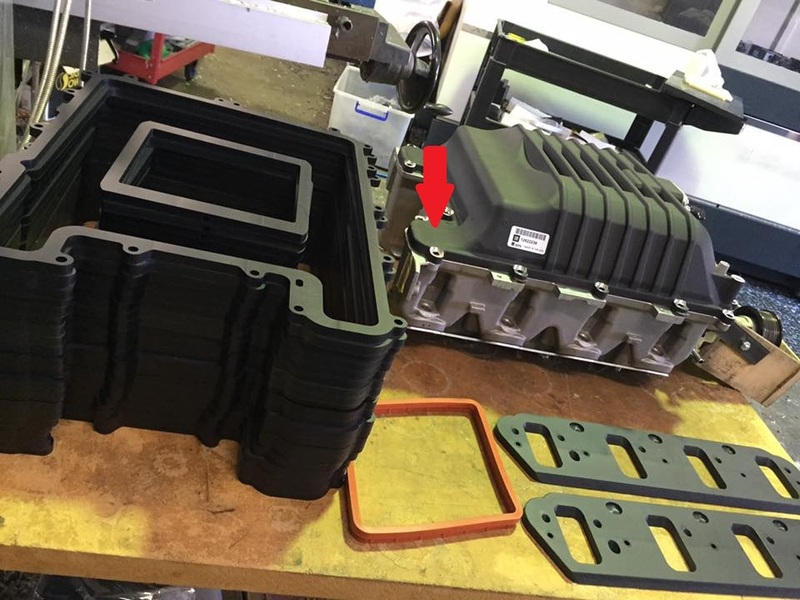 The Lid spacers inhibit heat transfer into the lid, they also improve air flow to the rear cylinders on both banks as well as aid in the air flow from the blowers discharge port to the intercooler brick face due to the added air gap between the discharge port and the intercooler brick. This allows the compressed air to take less of a "bend" to use the intercooler bricks entire surface area. Last edited by GenF-GTS; 06-02-2017 at 02:10 AM. This appears to be a good product. Video of gains would certainly be appreciated. I intend on dynoing etc but simply have not had the time. We tested on NickGTS's car he was a good 7c colder than me on a 40c day both of us running the chiller and his lid was physically a lot colder than mine. He also went to the track and only got in 2 runs as it got rained out but the logs showed colder IAT2 during the entire run compared to all other logs, his mph was up about 1-1.5mph, the cars tune was left the same too. Last edited by GenF-GTS; 06-02-2017 at 12:19 PM.